Examples of my work can be seen by clicking the following links House, Sculpture, Exterior mostly, Projects. More recent work can be seen in the Post entries to the right of this column. 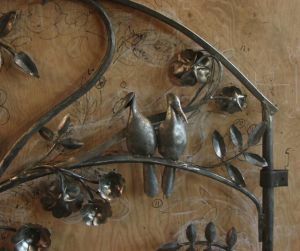 Some garden sculptures can be seen in person at the Tangled Garden, in Grand Pré, Nova Scotia and maybe later this year at the Historic Gardens in Annapolis Royal. Designer Craft Shop in Halifax offers some of my smaller pieces for sale. I was away to the UK for three weeks where I had an opportunity to view the iron collection at the Victoria & Albert Museum and to visit a couple of brilliant smiths in the Herefordshire region – Henry Pomfret and Jenny Pickford. Some of that experience will doubtless begin to surface in my work this winter. You are welcome to contact me directly if you would like to discuss a project for your space.